Big Apple-based model, Louisa Warwick is striding down the runway and into our lives, having attended and walked in some of the biggest names in Fashion Week this season. The NYU student has worked with Calvin Klein, L’Oreal and TRESemmé to name a few, and I look forward to see what else she’s got planned. 9am: I woke up and ate breakfast straight away: avocado on toast with chopped up boiled eggs. On the side, I snacked on mixed berries and drank an English breakfast tea. After finishing up, I left the house and attended two castings. Typically, for castings, I’ll wear tight fitting black clothing, topping off the outfit with a leather jacket and chic biker boots. My hair would be natural-looking with minimal makeup – the less the better, as the client usually want to see you as a ‘blank canvas’. 12pm: After the castings, I headed to the Leanne Marshall show at Skylight Clarkson. 1pm: For lunch, I had a chicken and spinach salad with a chocolate chip cookie backstage. 5pm: After the show, I headed to Barry’s Bootcamp for a full body workout session, which is a favourite of mine! If I’m not working out here, I’ll probably be at Dogpound – I love their boxing sessions. 6pm: After an hour’s workout, I returned home to study for an accounting exam, as I’m currently in my last year studying Sports Management at New York University. After I finish, I’ll probably explore Sports Pr & Marketing as that is what really interests me! This evening, for dinner, I had salmon with asparagus and tomatoes – my favourite! Just before bed, in addition to mornings, I always do my skincare routine which involves cleansing, toning and moisturising. Once a week, I’ll also do a face mask and a hair mask – I prefer not to change my regime around events like Fashion Week as I find I’ll be more prone to breakouts. 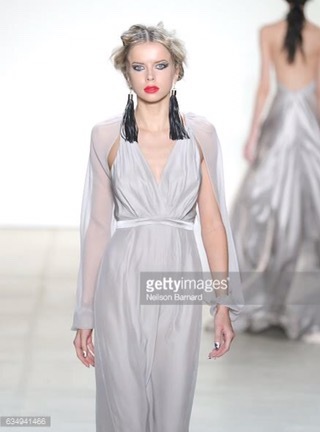 Thank you to Louisa for sharing a day of New York Fashion Week!